Bed & Breakfast and Lodging in De Smet, South Dakota. A great hotel alternative. Welcome to Heritage House Bed & Breakfast! 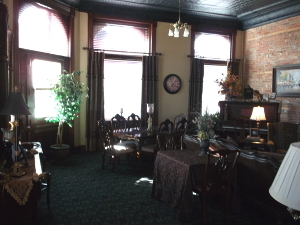 Come relax and enjoy the old fashioned ambiance of the Heritage House Bed & Breakfast, built in 1888. This handsome two story building would come to house the Waters Land and Loan Co., the Abstract Company, and a year later the Germania State Bank. This building had the historical importance of being a place where the pioneers would come to stake their claims. Some even say that the Ingalls banked here. Over one hundred years would go by before it would become the beautiful bed and breakfast is today. The innkeepers, Carl & Kim Ernst, bought the vacant building and spent three years commuting from Colorado to South Dakota to carefully restore this historical landmark into a bed and breakfast with old world charm and character. Kim grew up in De Smet and her heritage can be traced back as far as her great great grandparents, who may have known the Ingalls family. So it would only be fitting that they name the place the Heritage House. Situated on the quiet corner of 2nd Street and Calumet Avenue, right across the street is the historical site of Pa Ingalls' dry good store, the Heritage House is also within a few minutes' walking distance to the famous savories chantey, and the Ingalls home that Pa built. 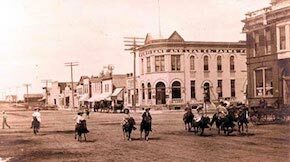 It is an ideal setting to enjoy the heritage of this famous town, and stroll the streets that Mary and Laura Ingalls strolled as children. Classic style and historic charm along with warm hospitality and gracious service welcome you to Experience the Legend of the Heritage House. The elegant dining area of the Heritage House Bed & Breakfast is filled with an interesting collection of antiques an exquisite fireplace and the original tin ceiling. Here is where you will begin your morning with a richly brewed cup of coffee or tea. You will enjoy a wonderful breakfast prepared fresh for you, including your choice of juice, seasonal fresh fruit and a piping hot entree' served on our fine china. "We had a wonderful getaway - excellent breakfast. We really like your B&B, and we hope to come stay again."